AquaBlok is a bentonite-based sealing material consisting of aggregate (usually limestone aggregate) coated with powdered sodium bentonite. In its dry form, AquaBlok looks and handles like small stones. Once hydrated, the bentonite coating swells, fills in the pore spaces of the aggregate, and creates a low-permeability seal without mechanical compaction. AquaBlok’s versatility and ease of installation makes it suitable for a range of applications, including anti-seep collars (aka trench dams or trench breakers), cut-off walls, pond construction and repair, and many more. To get a good idea of AquaBlok’s capabilities and ease of use, the below “bottle test” is recommended. Once the bottle has been cleaned and dried, fill it with water. Add the AquaBlok sample and close the bottle. Note AquaBlok’s ability to uniformly descend through the water column. Invert the bottle, ensuring all material has settled at the mouth. 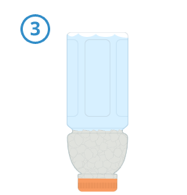 Leave the bottle inverted for approximately 24 hours to allow AquaBlok ample time to hydrate. Keeping the bottle inverted, remove the cap. As you can see, AquaBlok has fully hydrated and created a reliable seal. As the bentonite coating hydrates and swells, AquaBlok will expand vertically beyond the original fill line. Over time (hours), you will note that the bentonite has expanded and filled the voids between the aggregate. This process allows AquaBlok to self-compact, eliminating the need for mechanical compaction to achieve a low-permeability seal. Note that AquaBlok remains plastic. You can see this by gently pushing on the bottle where the material has hydrated. AquaBlok never hardens, like concrete. This allows it to conform to complex shapes, like that of a pipe in a trench. AquaBlok’s saltwater formulations have also provided reliable seals in brackish and marine environments, such as estuaries, tidal bays, saltwater marinas, and open oceans.